Headset VR is only the tip of the iceberg when it comes to immersion. Experiences that look and sound great are undoubtedly effective for creating instantaneous feelings of immersion, but their engagement potential is limited. This is because they only provide information to two sensory inputs – sight and sound. The more sensory inputs that we can connect with and stimulate during a VR experience, the more realistic and believable the experience can seem. 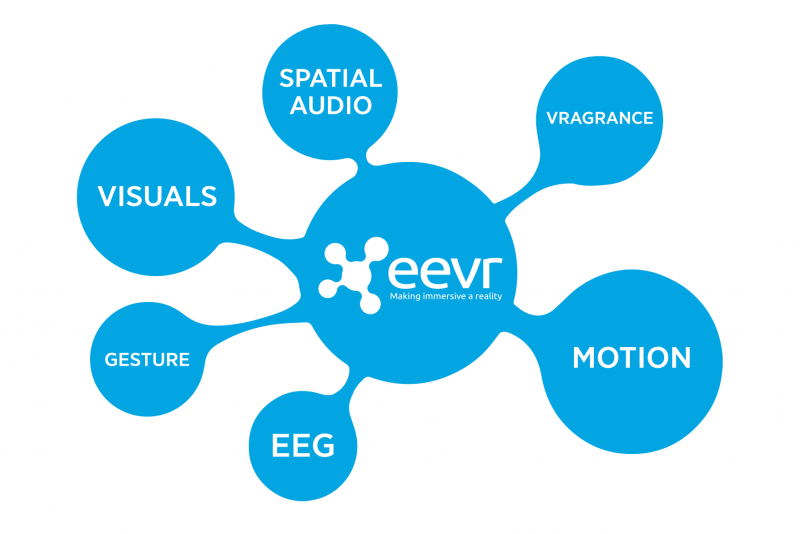 This is why our EEVR system utilises motion, touch, smell and EEG monitoring as well as sight and sound. EEVR is an enhanced environment virtual reality system that combines a range of industry leading and custom manufactured technologies to create bespoke experiential VR for event and exhibition usage. We have created custom motion chairs that can be programmed to subtly mimic the appropriate motion of any VR experience. The overall degree of tilt is less than ten degrees, but testing has shown that this is enough suggestive movement to trick the brain into feeling a perceived sense of height or direction. Usually, motion sickness occurs in VR when the experience tries to simulate a sense of directional movement (walking, driving, flying etc). With our motion chairs we have been able to create both fast and slow paced movements with little to no motion sickness. Two of our most popular experiences, Zen and The Limit both use this technology. You’re welcome to try them if you pop by our studio. Using Leap Motion technology we have been able to create installations that allow audiences to view and use their hands virtually to interact with their surroundings. No remote control required. One of our experiences allows users to virtually touch and hold a virtual cookie. Using industry leading Oculus headsets and high quality CGI graphics and video, our experiences look breath taking. These headsets can refresh images at a rate of 90fps, meaning the image on screen responds smoothly and instantaneously to head movements and rotations, dramatically reducing the chances of technology based motion sickness. Our software controlled scent units can be controlled to release a variety of distinctive scents at timed intervals throughout our EEVR experiences to add memorable impact and awareness to key moments. Popular scents include pine trees, lemon, grass, baked cookies and mint. We incorporate our specially designed sound formulas into our EEVR experiences to provide responsive, realistic audio. Most VR experience use binaural audio – a type of technology that simulates the distance and placement of sound objects within a 360 space, but we use spatial audio which is slightly more realistic. It works similarly by simulating the way sounds are heard from sources of varying distances and locations, but spatial audio also responds to users head rotation and adjusts the way the sound is heard accordingly. We can add EEG monitoring functionality to any of our custom experiences to create a whole new layer of exciting interaction. We can design experiences with multiple outcomes that can be determined by brainwave patterns and heart rate. For example, our space disaster installation ‘The Limit’ determines whether users survive or die based on their ability to stay calm. Our custom made motion chairs use suggestive motion algorithms to counteract the effects of environment based motion sickness. This enables us to create VR experiences that move along motion paths with little to no adverse effects (you can read more about how our chairs counteract motion sickness here). We use high quality CGI visuals to build our virtual worlds and we implement all of our experiences onto industry leading, reliable headsets such as the Oculus Rift (enables visual playback of up to 90 fps), creating smooth and responsive movements as users rotate their heads. Our experiences use custom developed sound software to build multi-source emitting objects and planes that then send compiled sound signals to each ear, creating the effect of a 3D environment of sounds that react to head movement realistically (you can read more about our use of spatial sound here). We are also able to utilise leap motion hand tracking to allow users to interact with their virtual environment and see their hands within the experiences. One of our recent projects allowed users to see, smell and digitally pick up a virtual reality cookie. Another exciting layer of immersion we can add to our experiences comes from the use of EEG monitoring. We can monitor user’s brain waves and heart rate to determine the outcome of an experience. Our space adventure installation called ‘The Limit’ uses this technology to determine whether users survive or die a space disaster by monitoring their ability to stay calm. Interested in EEVR? Call us on 01767 317614 to enquire.